With November rolling around again we are quickly approaching a very special anniversary, a day that one little dog made us all very proud. 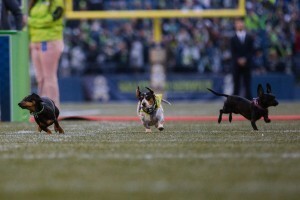 That little dog is an especially plucky Weiner dog named Cowboy (formerly Cuddles) who raced his heart out at the Seahawks halftime show and pulled a stunning 2nd place in his heat. Cowboy first came to Ginger’s Pet rescue from a high kill shelter when he was just a puppy. He soon found a loving home with wonderful people who are very supportive of his athletic dreams. 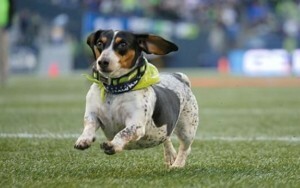 Cowboy says he has been training hard all year long and hopes to qualify for this years halftime show Weiner Dog Race. He has fond memories of being treated like a celebrity by the players, but the best part of the whole experience for him was the thrill of the race. 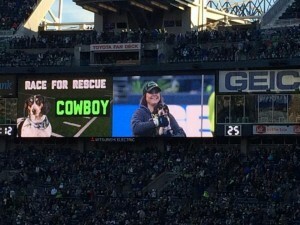 All of us here at Ginger’s Pet Rescue are rooting for you Cowboy, we love a happy ending!